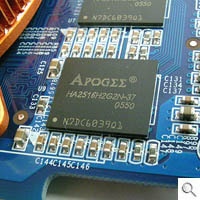 Chaintech has even adopted using their own memory parts and is branded under their Apogee brand name. But 3.7ns is slow no matter what. 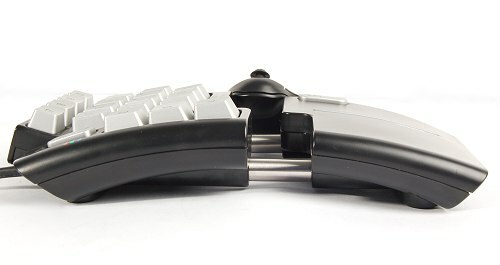 A standard set of outputs, including DVI-I. A CD containing drivers and an S-Video cable are the only items in the package. NVIDIA's rejuvenation of its mid-range offerings with the new GeForce 7600 series has been a resounding success, so it seems that its neglected lower end mainstream graphics cards are due for some tender loving care too. Reports have emerged recently of a new low-end card dubbed the GeForce 7300 GT; its price and performance points are aligned to bridge the present gap between the GeForce 7300 and 7600 series. When launched, this new card should offer more options for those with a budget of just under US$100, but for now, the extremely budget conscious segment has a new contender with Chaintech's latest GeForce 7300 GS for PCI Express. 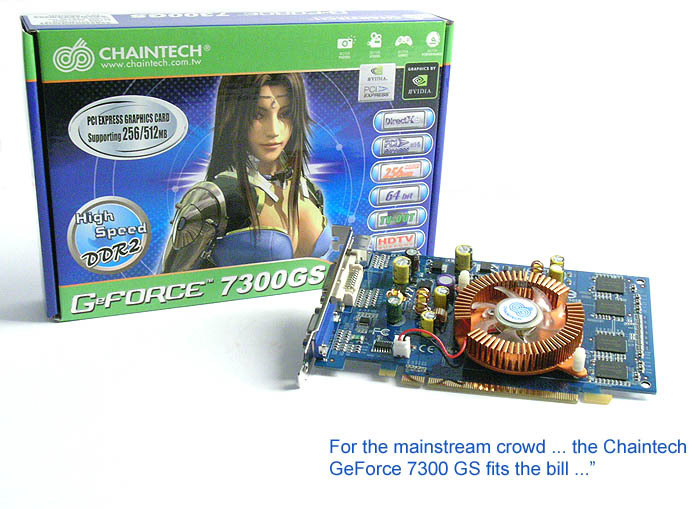 While the standard NVIDIA GeForce 7300 GS comes at a core clock speed of 550MHz and 810MHz DDR for the memory, Chaintech offers an even lower-end version of this by using 256MB worth of cheaper DDR2 memory rated at 3.7ns compared to the usual 2.5ns used. In view of that, the memory clock also has been revised accordingly with the end result at a low 533MHz DDR. 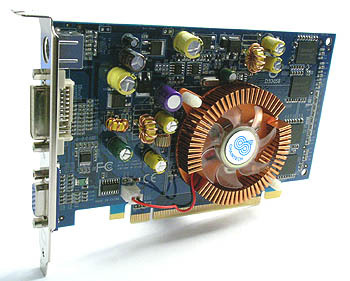 This chipset also comes with NVIDIA's TurboCache technology that allows the GPU to utilize system RAM (up to 512MB in total) for graphical processing but the card is hobbled by a limited 64-bit memory bandwidth (as with other cards of its class). 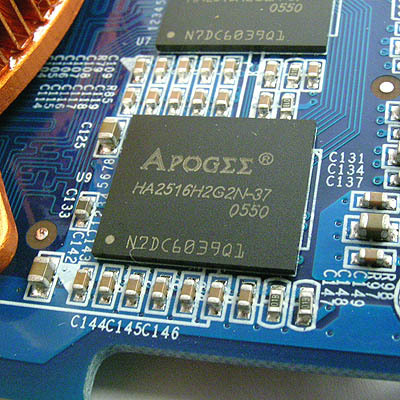 To an already laggard chipset like the GeForce 7300 GS, the lower memory clock certainly had a significant negative impact to its performance and in games like Quake 4, it could translate to a more than 50% drop in frame rates compared to a reference model. Overclocking was also very limited with the memory faltering soon at 550MHz DDR, though we highly doubt anyone would even bother in the first place. Thankfully, the rest of the card remains faithful to the reference design, with the same G72 core that comes with 3 vertex and 4 pixel pipelines. The 64-bit memory bandwidth also makes it unsuitable for most modern games despite its DirectX 9.0 lineage. So what's it good for then? Well, for the mainstream crowd where the 2D environment takes precedence over 3D, the Chaintech GeForce 7300 GS fits the bill since it probably handles those casual games found over the Internet and other older games with ease. Most importantly, NVIDIA's PureVideo technology aids in the playback of videos and particularly, adds hardware decoding and acceleration for high definition formats like H.264 and MPEG HD, giving it a chance to shine in home theater PCs. 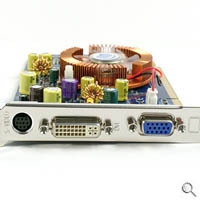 This is aided by the variety of connectors on the card, from the versatile mini-DIN output to the increasingly popular DVI-I and finally the standard VGA output. 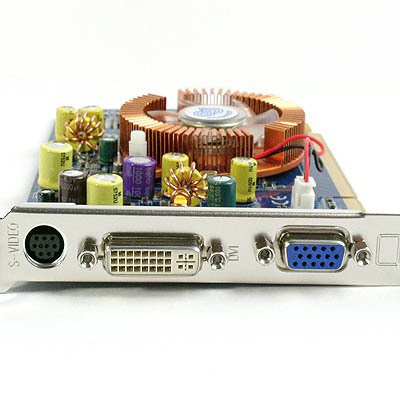 A mini-DIN to S-Video converter included in the package also helps to increase the options for the Chaintech GeForce 7300 GS. It was just too bad that Chaintech did not take full advantage of this by offering a low profile, passively cooled version that would have appealed more to this group of consumers. Despite that, the fan based card is a good tradeoff since it can boast of low operating temperatures. 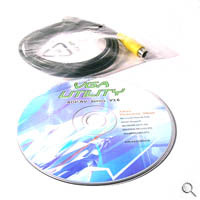 Finally, the software included with this budget card is unsurprisingly quite minimal, as the CD contains the graphics drivers with Adobe's Photoshop Album the only application of note. The GeForce 7300 GS is a mainstream product targeted at the budget conscious user looking for a step up from integrated graphics. Chaintech seems to feel that there is enough demand within this segment to warrant a custom version built solely as an entry-level model with cheaper memory. While the Chaintech isn't the only card running with 533MHz DDR memory speeds, it is one of the cheapest available in the market and can be found going under US$60 at on-line retailers, which is US$10 cheaper than its competitors. This card will not be a bestseller at any rate, but if you're tight on a budget and you absolutely want a GeForce 7 series card, the Chaintech GeForce 7300 GS may be for you.